Fylingdale, originally uploaded by ibanda. 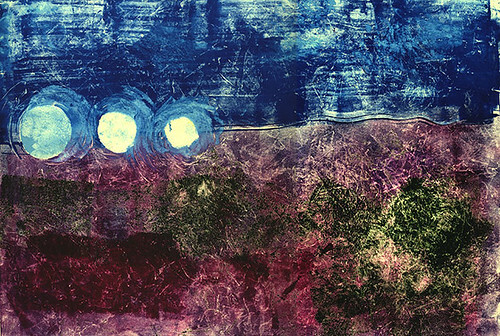 A monotype print inspired by the famous 'golf balls' of Fylingdale Early Warning Station. When I last saw them the heather was in bloom and the air was thick with the scent of honey, while the three structures loomed on the horizon. A surreal experience. I'm also working on a painting with the same theme. I keep meaning to post a photo of the work in progress. The danger of stylised form, which either comes into the world stillborn, or else, too ill to live, quickly dies. The danger of ornamental form, the form belonging mainly to external beauty, which can be, and as a rule is, outwardly expressive and inwardly expressionless. The danger of experimental form, which comes into being by means of experimentation, ie, completely without intuition, possessing, like every form, a certain inner sound, but one that deceitfully simulates internal necessity. I've posted this as a follow up to my earlier post about Rothko. It seems to tie in - especially 2 - with my concerns in that post about abstraction as mere pattern. 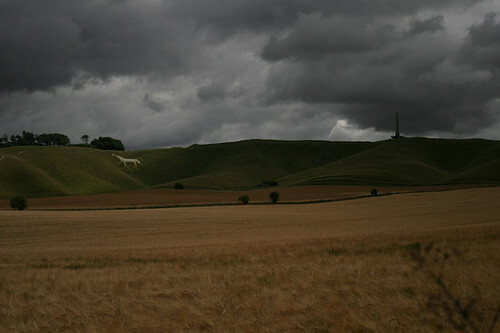 Cherhill white horse under cloud, originally uploaded by ibanda. I've started posting on Flickr again, after a longish hiatus.